St John Greene grew up in the West Country where he met his teenage sweetheart, Kate. A qualified paramedic and lifeguard, St John, known to his friends as Singe, founded Training Saints, which specializes in teaching extreme sports to young people. Since Kate's death Singe has devoted his life to raising their two young sons, Reef and Finn. He continues to run Training Saints and is chair of governors at the boys' school. He spends all of his free time teaching them the things he loved to do with Kate: sailing, scuba diving, jet skiing and power boating near their home in Somerset. , Mizan Publika (Indonesian), Hunan Literature and Arts Publishing House (Chinese simplified), Swiat Ksiazki/Weltbild (Polish), Ikar (Slovak), The House of Books (Dutch), 20/20 Editora (Portuguese/Portugal), Mlada Fronta A.S. (Czech), Newton Compton (Italian). On her deathbed, Kate Greene's only concern was for her two little boys, Reef and Finn, and her loving husband, Singe. She knew she'd be leaving them behind very soon. 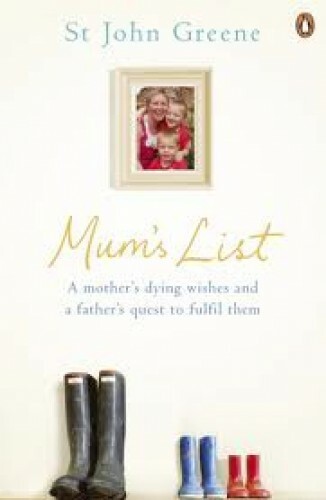 Over her last few days, Kate created Mum's List. The couple talked and cried together as she wrote her thoughts and wishes down, trying to help the man she loved create the best life for their boys after she was gone. It wasn't the first time Singe and Kate had faced the spectre of death. Four years earlier, doctors discovered a large lump in baby Reef 's abdomen. Kate, pregnant with Finn, was so distressed that she gave birth dangerously early. Both boys pulled through, but afterwards Kate received the diagnosis that every woman dreads . . .